Sign in: I already have a 37signals ID. Do I have to create a new one for a new account? If you’ve already set up your 37signals ID, you don’t need to create a new one, even if you’re seeing a prompt to set up a new username. Instead, use the links to use your existing 37signals ID. When you’re signing up for a new account, you’ll see this at the top of the screen. When you’re accepting an invite to an account, click the links on the top of the screen to use your existing 37signals ID. Note: If you get a screen like the one below, then you’re already part of that account. The person that invited you tried to invite you to the entire account again rather than giving you access to the new project. 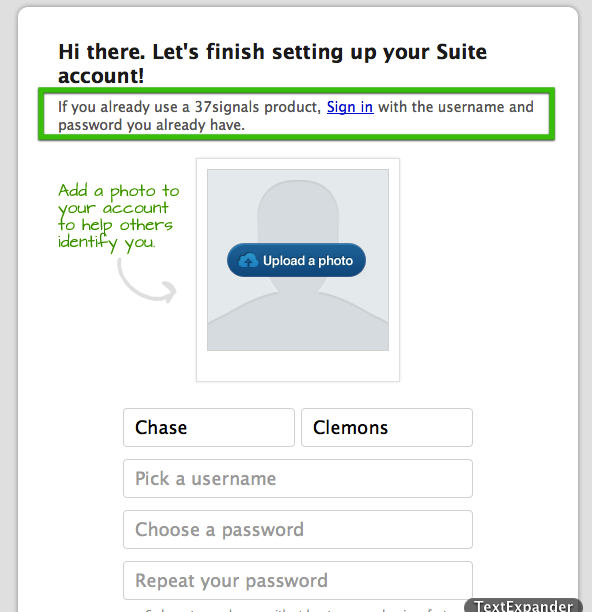 Contact the account owner or admin and have them update your project access instead.